Solar Pull LED flashlight is powered by a built-in solar panel or pull string dynamo generator, so its always ready to use. The built-in high-efficiency lithium battery allows the Solar Pull Light to be charged over and over. Its 3 super-bright LEDs are unbreakable and never need replacing. The dynamo generator is powered by a string pull cord. Just grip the ring with your fingers and pull the string to a length of about 25� and release. Continuously pulling for 1 minute will provide 18 minutes of light. It�s as easy as that! Charging times by the solar panel vary based on proximity to sunlight. Full Sun for 5 hours provides 30 minutes of light. Daylight Indoors for 5 hours provides 15 minutes of light. Interior Light for 5 hours provides 5 minutes of light. 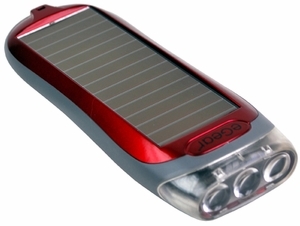 The Solar Pull�s compact size fits easily in shirt pocket or purse and is available in Red color. It weighs only 3.2 ounces. Weight (w batt. ): 3.2 oz. Size: 5.5" x 2" x 0.8"